This story was updated with additional personnel information from the Forest Service. Interior Department agencies are not taking any chances with the militia group currently occupying a Fish and Wildlife Service facility in Oregon, with two other offices closing down due to concern for the safety of the employees that work in them. The Bureau of Land Management -- the agency with which the occupiers have expressed their most significant grievances -- and the Forest Service both have shuttered their facilities in the Burns, Ore., area, though no occupiers have approached them. 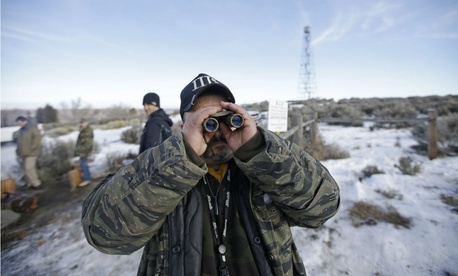 Armed militia members have occupied FWS’ Malheur National Wildlife Refuge since Saturday. No federal personnel or staff of any kind was present when the ranchers seized the building, and all employees have been told to stay home “until further notice.” Some of the 17 federal employees who report to the refuge are teleworking, according an Interior Department official. The BLM Burns district office employs 97 permanent and 21 seasonal or temporary workers, all of whom have also been told to stay home while the facility is closed. About 10 of those workers are teleworking, while the rest are on paid administrative leave. A Forest Service spokesman said the Emigrant Creek Ranger District office in Burns is closed until further notice "in the interest of employee safety." Some of the 35 employees who work at the office are teleworking or reporting to remote locations, while others are on administrative leave. President Theodore Roosevelt established the Malheur refuge in 1908 as the Lake Malheur Reservation; it now encompasses 187,757 acres of wildlife habitat, according to the FWS. The White House has referred to the situation as a “local law enforcement matter,” saying its primary concern at this point is the safety of federal personnel. Press Secretary Josh Earnest said on Monday that “to our knowledge” no federal employees were at risk or in danger. Nathan Catura, national president of the Federal Law Enforcement Officers Association, said the federal government should take a more active approach, calling for the arrest of all the ranchers involved in occupation. For now, law enforcement officials have said the militia members are free to “come and go as they want.” The FBI is assisting local police, who said they are not currently monitoring the movements of the individuals.